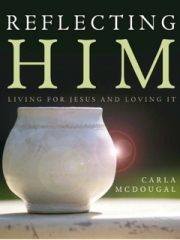 Reflecting HIM by Carla McDougal is an excellent Bible study for women. It is a ten-week study that encourages us to see God throughout the day, in the middle of our daily activities. In the book you will find helpful information in each chapter. Real Life Facts, Scripture Excavation and Hidden Treasures are just a few of the tools found in each chapter. The author also shares a bit of her own experiences. You will be motivated to see God in the every-day and walk in the Spirit... not in the flesh. If you're looking a great Bible study... this is an excellent choice.